I've never really done this type of thing before as for submitting pics so I hope I did this right! I don't know if you will put this up on your page or not ... I guess if you get the chance write back and let me know ok? i gunna get sum lyk urs..
yes its on ma wallpaper.. 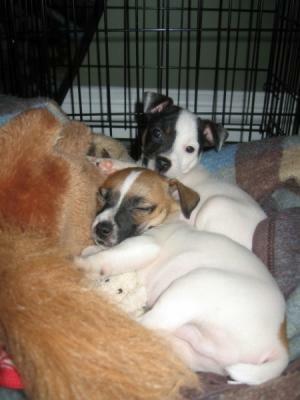 If anything is better than a Jack Russell it's two of them. These two look like a pair of likely lads. Double the fun, double the hijinks and double the enjoyment and love. Yes Eric, you did it right. Jack Russells have a reputation for being the "coolest dogs ever". And Marley and Hendrix are just beautiful. So I decided to enter them in the Jack-of-the-Month for February. Did anyone say you couldn't enter 2 dogs?